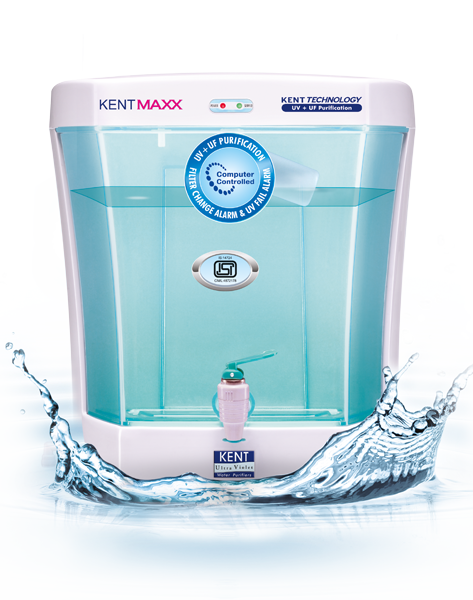 FEATURES INDIA’S ONLY UV WATER PURIFIER WITH STORAGE TANK KENT Maxx is India’s only UV water purifier with storage tank. It is suitable for wall mounting or table-top installation, providing users with a choice to install it as per their requirement. It has a transparent and detachable storage tank, which ensures easy on-site cleaning. The tank can be easily removed and cleaned without the help of a technician. Also the transparent tank makes the purifier visually appealing. DOUBLE PURIFICATION BY UV + UF Double purification by UF after UV removes dead bacteria, viruses and cysts from the fine pores of Hollow Fibre UF Membrane, thereby providing 100% pure, safe & tasty drinking water, which is ideal for consumption. WQA GOLD SEAL CERTIFIED KENT Maxx is tested and certified for its performance and quality by renowned laboratories of the world such as WQA in USA. WQA Gold Seal is one of the most recognized certification in the drinking water treatment industry and provides assurance that the products have been rigorously tested and comply with all the requirements of the testing standards. KENT Maxx is also CE certified. 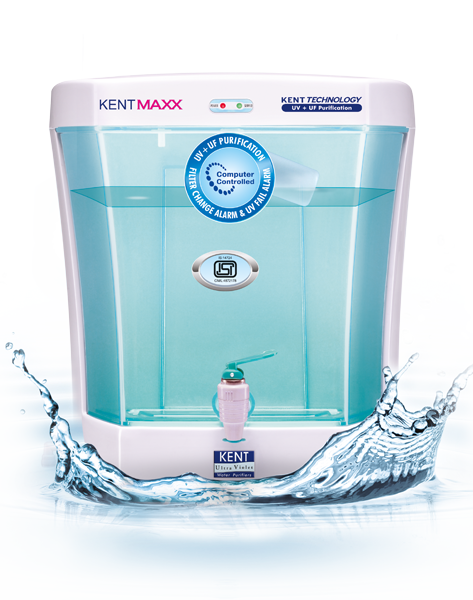 SUITABLE FOR LOW TDS WATER Since KENT Maxx is based on UV and UF technology that does not remove dissolved impurities, it is suitable for use where inlet water has low TDS (Total Dissolved Solids). PURIFIED WATER STORAGE CAPACITY OF 7 LITRES WITH DETACHABLE STORAGE TANK KENT Maxx has 7 litres of purified water storage capacity with a detachable storage tank for easy on-site cleaning. The storage tank ensures continuous supply of purified water even in the absence of electricity or running tap water. COMPUTER CONTROLLED OPERATION WITH FILTER CHANGE AND UV FAIL ALARMS Computer controlled operation has two unique features – Filter Change Alarm and UV Fail Alarm. Time based Filter Change Alarm notifies the user to change filters. UV Fail Alarm alerts the user when the UV lamp becomes inefficient. In both the cases, power supply to the purifier is cut off, thereby ensuring that impure water is not delivered to the user. HIGH POWER 11W UV LAMP FOR COMPLETE DEACTIVATION OF HARMFUL MICRO-ORGANISMS KENT Maxx uses high-powered 11W UV lamp instead of the Industry standard 8W UV lamp, to provide complete de-activation of harmful micro-organisms. High-wattage ensures better safety against harmful micro-organisms like bacteria and viruses. FULLY AUTOMATIC OPERATION WITH AUTO-START AND AUTO-OFF Fully automatic operation allows the purifier to begin purification whenever water level in the purified water storage tank falls below maximum, and stop when the tank is filled or when there is no inlet water supply. This ensures trouble free operation without the need of manual intervention. BUILT-IN SMPS THAT SUPPORTS WIDE RANGE OF INPUT VOLTAGE (100-300V AC) FOR HANDLING VOLTAGE FLUCTUATIONS KENT Maxx incorporates a built-in rugged SMPS (Switching Mode power supply) instead of a standard power adaptor. It is equipped to handle a wide range of input AC voltage (100 – 300 Volts) which enables the purifier to stay resilient towards frequent power fluctuations, a common problem in developing countries like India. SPIN-WELDED UF MEMBRANE HOUSING THAT PREVENTS TAMPERING First of its kind in the industry, UF membrane housing is spin-welded using the latest technology, which ensures high quality permanent joints. Welded housing also prevents tampering and improves membrane life. PUSH-FIT COMPONENTS FOR LEAK-PROOF PERFORMANCE All the fittings and components in the purifier are push (snap) fit to prevent leakages and wastage of water. Additional protection against leakages is built-in by using rubber O-Rings inside the push-fit fittings. FOOD GRADE, NON-BREAKABLE, ABS PLASTIC CONSTRUCTION Non-breakable feature of ABS plastic ensures higher durability & longer life of the purifier. Food grade classification ensures that no harmful chemicals leech into purified water.